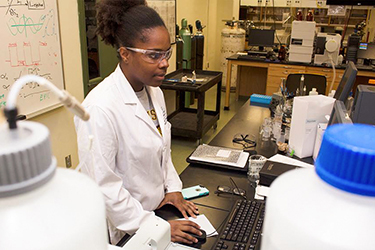 This page contains a variety of helpful resources and commonly used forms for current graduate students in the Department of Chemistry. This information is to help you consider whether you can qualify for additional travel funding from the College Office. Please contact the department office before travel. College funding is provided on a "first-come, first-served" basis. If you plan on attending a conference at any time during the academic year, it is in your best interest to apply as early as possible so that funding can be encumbered in your name. All requests for funds must be submitted prior to the funded activity using the Request for Special Projects Funds Form (PDF). Any requests received after the travel will be denied. A copy of your signed travel authorization must be attached. After you have travelled, the Department Office will submit a Request for Reimbursement form for you. All requests are processed on a "first come, first served" basis. When all funds have been expended, requests will be dated and held for any cancellations. If your event is canceled, please notify Rebecca in the Department Office so that the funds can be made available for another student. Students who travel to professional meetings to present paper or posters may request funds to match departmental support , not exceeding $250 for domestic travel and not exceeding $400 for international travel. Students may request funds for travel one time during the academic year. Students who attend professional meetings but do not present may request funds to match departmental support not exceeding $200 for domestic travel and not exceeding $400 for international travel. Students may request funds for travel one time during the academic year.